This was a project to design a boutique hotel in Sydney in an area that is diverse multiculturally, socioeconomically and professionally. The aim was to create a contemporary getaway from the hustle and bustle of the city life, without compromising elegance and grace. I designed the project and produced all the 3D images on ArchiCAD. Solar passive design means taking advantage of the sun’s natural energy to heat and cool spaces without the need for heating and cooling systems. A climate sensitive house design uses six key design principles and they are: orientation, thermal mass, window placement, ventilation, insulation and integrated gardens. All the drawings for this design were done by hand. The brief was to design a space with an iconic chair as the centrepiece. I chose the Barcelona chair. I created the space on ArchiCAD and made the majority of my objects and materials apart from the chair itself which was used from the ArchiCAD library. The Kings Cross Multimedia Centre is a redesign of the Kings Cross Library which is an Art Deco building in the Kings Cross. The brief was to create a multimedia hub for the Kings Cross AREA and its vicinity to serve this very diverse community. I designed and built this project on ArchiCAD including the 3D renderings. Before 2009 I knew nothing about Illustrator and then we were exposed to this amazing tool for five months as part of our computing lesson at TAFE and I have never looked back. This was our final brief in which we where to convert and design a separate garage. The clients were a 20 something year old professional who has come moved back, with her partner, to her family home. I created a dynamic space for a couple that loves socializing and entertaining and transformed this good old humble garage into an elegant and stylish home. I used the Illustrator tool for the entire project apart from the images that I borrowed from the internet for the colour inspiration, the background trees and the paintings for the walls. 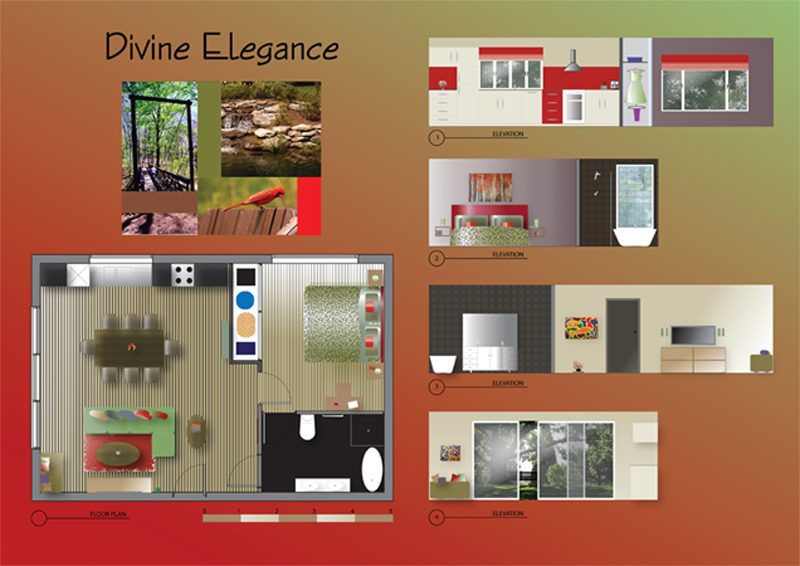 Sketching and rendering were two things that pleasantly surprised me the most when I started my interior design course. I did not think I was capable of producing such work and emulating all the surfaces and textures. I thoroughly enjoyed it then and enjoy it still. The bathroom was designed, hand drawn and hand rendered while the bed was traced from an image and hand rendered to show some rendering techniques.